Crossword like Bible books. 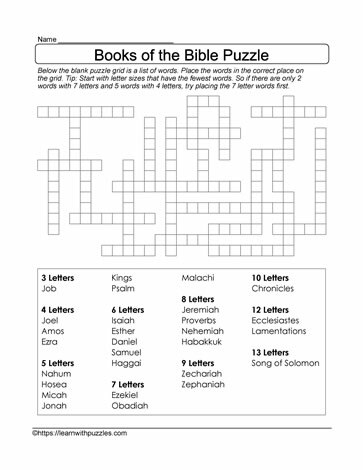 Here is a crossword-like fill in the blanks, printable puzzle about books of the bible. Use this puzzle in the regular classroom, Sunday schools, and homeschooling environments. Engage both vocabulary building skills and problem solving skills with this downloadable freeform puzzle. Start with the word with the least (JOB) or the most (SONG OF SOLOMON) number of letters. Then, complete the puzzle using letter cues from the initial words completing the puzzle. Puzzle is suitable for students in late elementary grades 4,5,6, and home schoolers.